Zákopníci was mentioned when the author mentions that Švejk and Katz carried out yet another field mass, this time by the pioneers. Zákopníci is the Czech term for pioneer troops or engineer troops. The term indicates that their role was to dig trenches but their task went well beyond that, included the building of temporary roads and bridges. In 1909 Pionierbataillon Nr. 3 was stationed in Prague (Ferdinandová kasárna in Karlín), but by 1914 no such units are found in the Bohemian capital. In the meantime the battalion had been transferred to Pettau (now Ptuj in Slovenia). The author probably "transferred" Katz's field masses from the front so in this context it's hardly relevant that there were no pioneer troops in Prague in 1914. That said he surely came across them at the front during the summer of 1915 so this sequence is probably inspired by these encounters (if they are fact-based at all). One such occasion was 20 July 1915 when pioneer company no. 8 from the 10th pioneer battalion were to assist IR91 and their sister regiments in building a bridge across Bug (see Ritter von Herbert). The attempt was abandoned due to the swollen river and that very night the regiment was ordered to urgently march to Sokal. U zlatého věnce was mentioned when Švejk tells Katz that he dropped by and overheard a story about the man from Nová Paka who landed in trouble by handing back things he had found. This is, according to Švejk, a universally bad idea. U zlatého věnce was a tavern in Královská třída, named after the building that housed it. Newspaper adverts and minor notices from around the turn of the century show that there was a guest house here. They announced meetings of a trade union and theatre performances so it was probably a spacious establishment. In 1910 Josef Tichý is listed as owner but in 1912 no pub is listed at this address any more. Today the site is occupied by two different houses, but we don't know when then original building No. 362 was demolished. Okresní hejtmanství Nová Paka is mentioned by Švejk in anecdote he tells Katz. At U zlatého věnce he had spoken to a 56 year old man from the countryside who had gone to their offices to ask why his carriage had been requisitioned for war duty. Here he had been thrown out immediately. Okresní hejtmanství Nová Paka was the political administration of the Nová Paka district. It is not known exactly where the offices were located but it assumed that it was in the town centre. 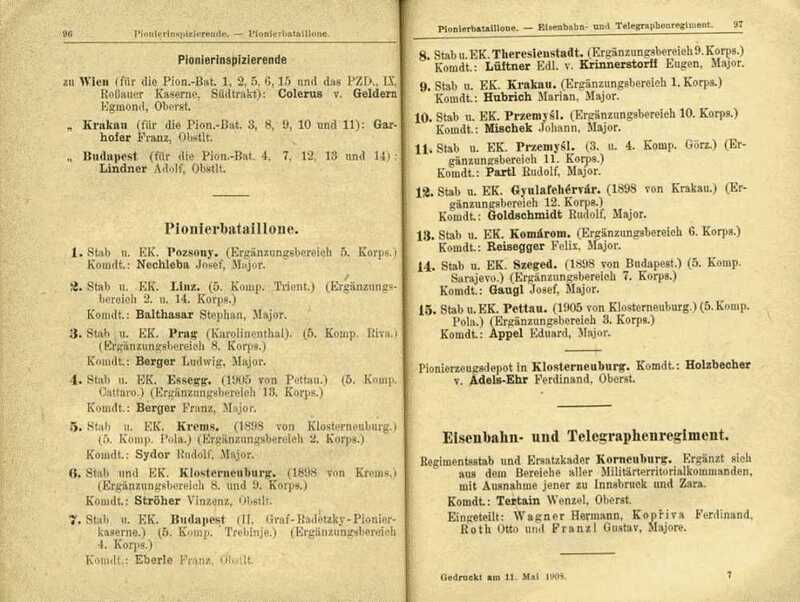 In 1913 the district's population number was 64,628 and consisted of the boroughs Hořice and Nová Paka. The district was relatively new, created on 1 October 1903 from areas that previously had belonged to "okresy" Jičín and Pardubice. Uršulinky is mentioned in the anecdote about the holy water of Lourdes that caused a loose stomach. Sjå Vlašim for more details. Uršulinky is the good soldier's term for Klášter Voršilek, a monastery with adjoining church in at Národní třída in Prague, until 1918 Ferdinandová třída. It belongs to the Ursuline order, a catholic organisation that is mainly preoccupied with the education of girls. It derives its name from St. Ursula. From 1958 the building complex has been under heritage protection. The monastery was built from 1674 to 1676 and also during the Habsburg reign it provided boarding and education for girls. Sirotčinec u Benešova is mentioned when Švejk tells he pious field chaplain about the holy water from Lourdes that caused stomach trouble for the children at the nursery home. Sirotčinec u Benešova surely refers to the home for parentless children in Benešov, "Domov". It was built around the turn of the century, was owned by the town, and seems to have been located below Konopiště castle. [1.12] U uršulinek mají v klášteře lahvičku s mlékem Panny Marie, kterým kojila Ježíška, a v sirotčinci u Benešova, když jim tam přivezli lurdskou vodu, dostali po ní sirotkové takovou běhavku, že to svět neviděl." U Piaristů is mentioned by the pious (and drunk) field chaplain when he asks his colleague Katz if he doesn't believe that the thumb of John the Baptist is found in this church. U Piaristů is a colloquial term for Kostel svatého Kříže, a monastery with church and a school located at the corner of Na Přikopě og Panská ulice that until 1912 belonged to the Piarist order. They are a Catholic educational order founded in 1617 in is the oldest of its kind. Their main purpose is to provide free education for poor children. The church which is built in a classical style was constructed between 1816 and 1824. Amongst those who studied here was Vrchlický. After the introduction of a new school law in 1869 the state took over and one part became a gymnasium (German) and the other a teacher's institute. In 1912 the Piarists finally sold the building. Today the church is run by the catholic institute Society of St. Francis de Sales (Salesians of Don Bosco). It was on the street corner by this church that Lukáš was to meet a lady, when on a walk with the dog Fox, he unfortunately bumped into Kraus. We already know the end of that story.